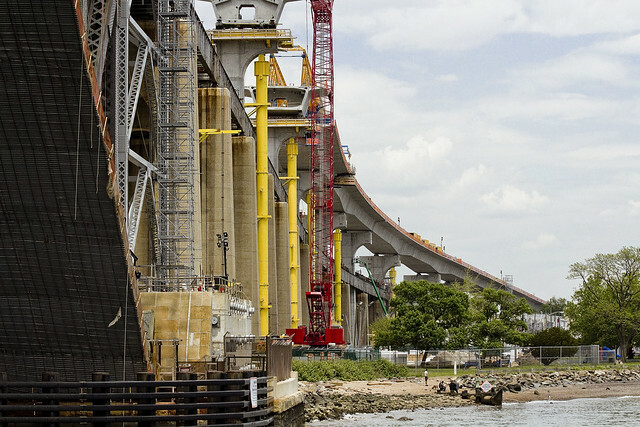 Bayonne Bridge progress, in today’s post. The Bayonne Bridge spans the Kill Van Kull waterway, connecting Staten Island with Bayonne, New Jersey. 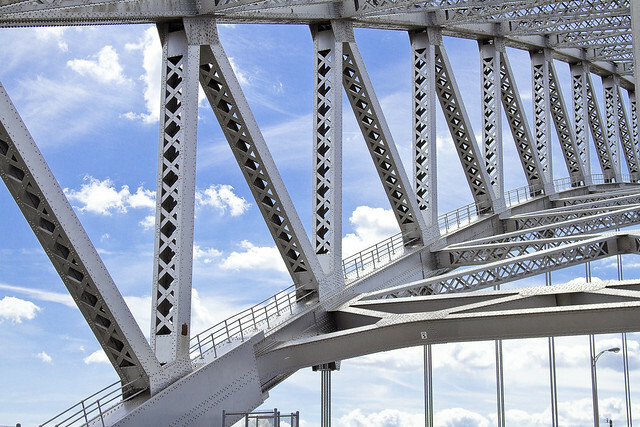 The fourth largest steel arch bridge upon the earth, it was designed by Othmar Amman. 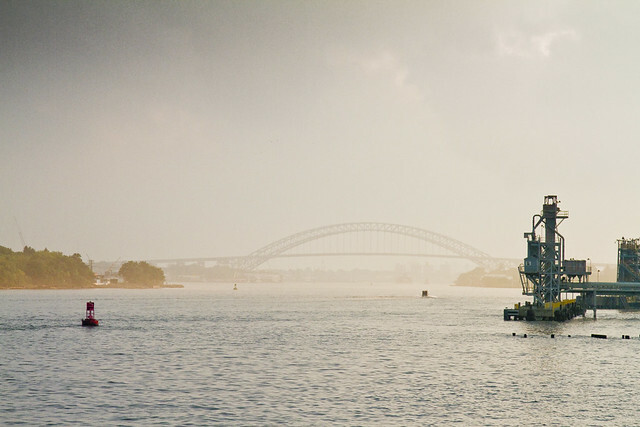 Bayonne Bridge’s origins were commemorated in this 2010 post. 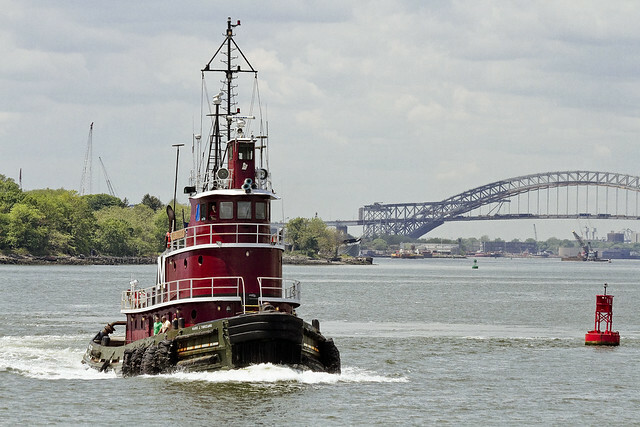 The Bayonne Bridge, and the Frederick E Bouchard tug, were discussed in this 2012 post. Also back in 2012, I walked over the original Bayonne Bridge for the last time. In August of last year, I gathered the shots featured in this 2015 post. A new class of cargo ships, the Panamax, will soon become standard for global trade. These gargantua have necessitated the widening of the Panama Canal, and will be too large to fit under the Bayonne Bridge in its original configuration at high tide. 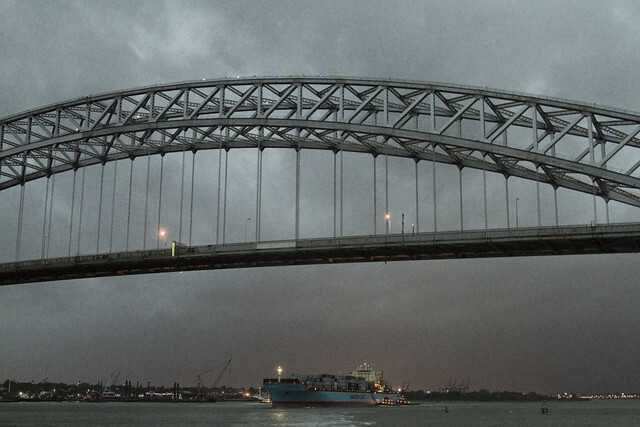 Given that Port Elizabeth Newark is found just beyond the Bayonne Bridge, the Port Authority of New York and New Jersey has been forced to take steps. 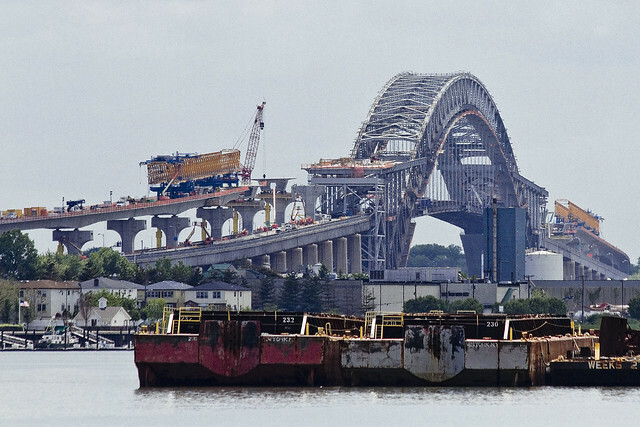 A seperate project is underway to increase the draught of NY Harbor’s Ambrose Channel and Kill Van Kull to fifty feet instead of forty via dredging, but the roadway of the Bayonne Bridge is being replaced by a new one which will be high enough to accommodate the new class of cargo ships. In the shot above, you can see the project is well underway. The shots in today’s post were captured from the waters of the Kill Van Kull in May of 2016, btw. The new roadway is quite a bit higher than the original, and the older one is slated to be demolished. 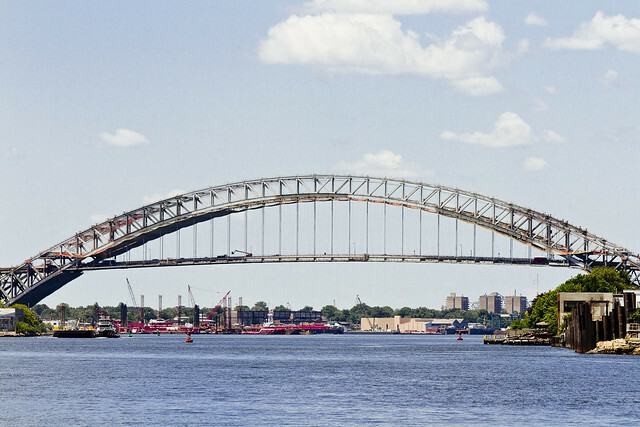 Unlike the Kosciuszko Bridge at Newtown Creek (which is being fully replaced), the project engineers have decided to retain the original steel arch structure and approaches to the span. Also, unlike the Kosciuszko project, I have no special access or knowledge of the project beyond some water access. 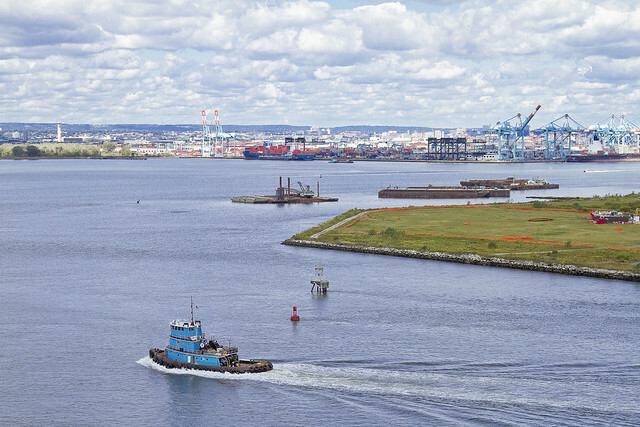 I can tell you that certain harbor and shipping industry magnates I know favored demolishing the span entirely, reasoning that another class of mega cargo ships is inevitable, and that access to Newark Bay is paramount for the economy of the Northeastern United States. 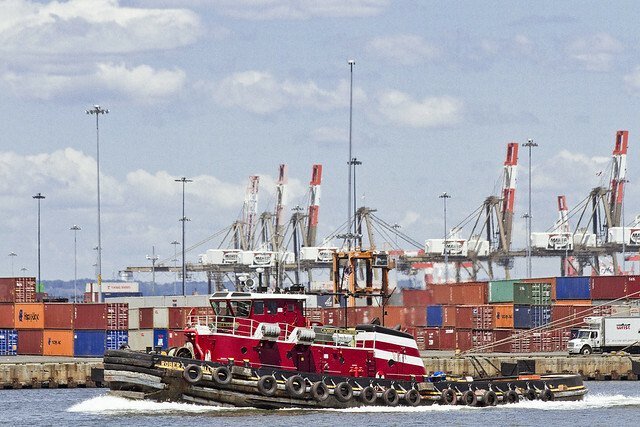 Right now, Port Elizabeth Newark is the second largest port facility in the USA’s part of North America. 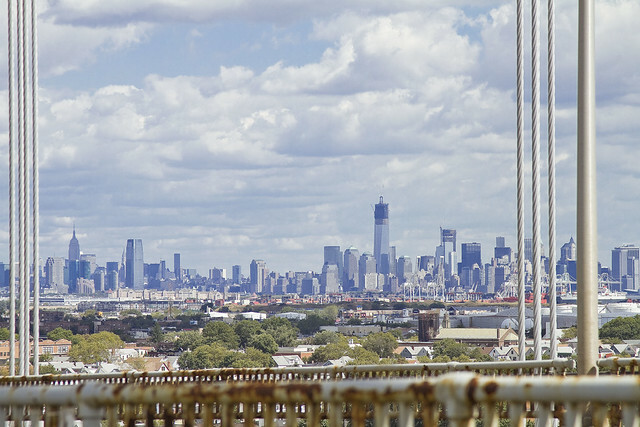 Bayonne Bridge provides a critical vehicular path to Staten Island and Brooklyn via the Verrazano Bridge for the trade items which arrive there. From a purely esthetic point of view, the composition and positioning of the new roadway is pretty “fugly.” Amman is turning in his grave, I’m sure. As mentioned yesterday, one is taking a short break – hence the singular image which greets you above. Back soon with new stuff. A recent Working Harbor Committee excursion, one of our education tours for kids (typically inner city teenagers who are introduced to the idea of a career on the water or at the ports by Martime professionals and Coast Guard Officers whom we bring onboard) headed out to Port Elizabeth Newark. These kids tours are what WHC is really about, and the public tours we do are actually fundraisers that support these other efforts. Your humble narrator was onboard solely to photograph this time around, and I soon found myself focusing in on the Bayonne Bridge reconstruction project. 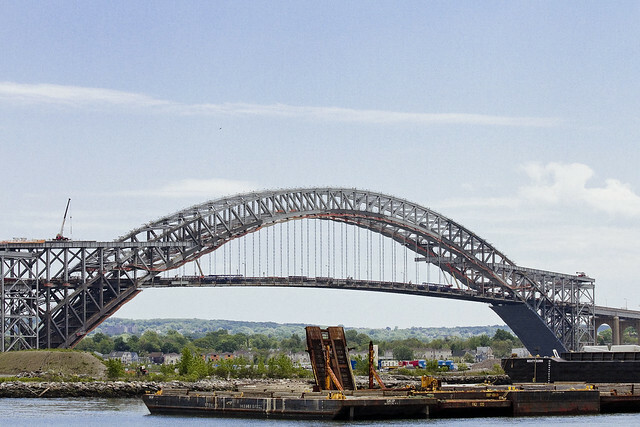 There are three major bridge projects underway in NY Harbor at the moment – two are replacements (Kosciuszko Bridge at Newtown Creek, and Tappan Zee over the Hudson) and the third is a retrofit – Bayonne Bridge. 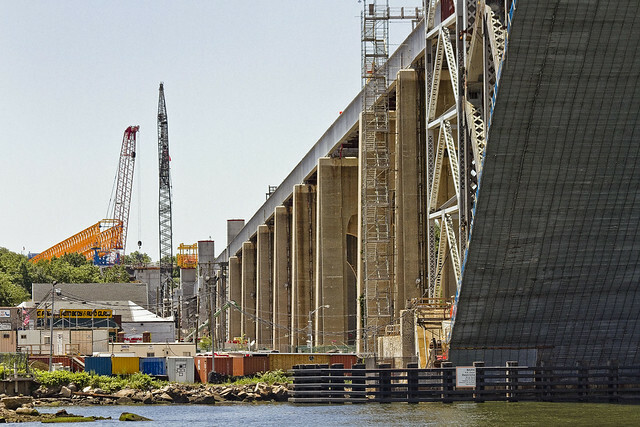 In the case of Othmar Amman’s masterful Bayonne Bridge, the roadway is being raised to allow a new class of cargo ship access to the Port Newark terminals and it’s the BB’s owner which is running the show – The Port Authority of New York and New Jersey. 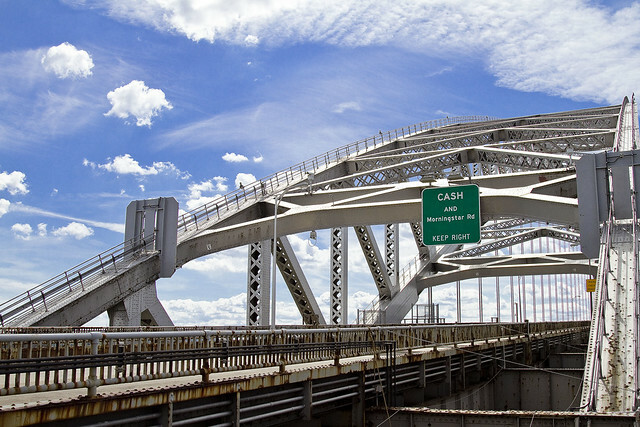 Bayonne Bridge spans the Kill Van Kull, connecting Staten Island’s North Shore to New Jersey. Just beyond it is the busiest cargo operation in the North Eastern United States. The continuing modernization of global container based shipping operations has created a sort of arms race to see how big a cargo ship can get (economy of scale) and the most recent iterations of these giants cannot cross under the roadway. 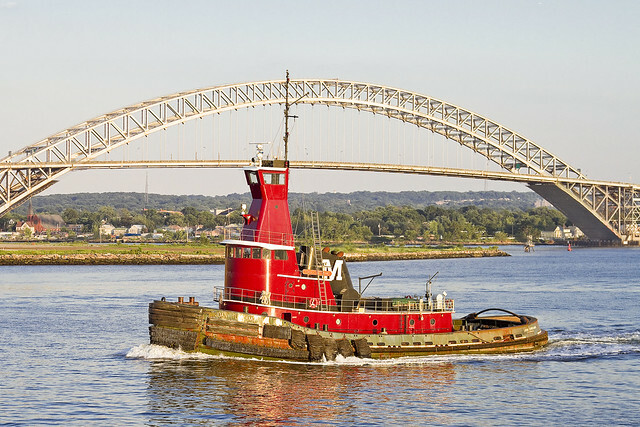 In order to remain economically viable, the Port Authority has been forced to redesign the bridge so as to accommodate these larger vessels. There’s all sorts of “big industry” involved in this sort of undertaking, and in the shot above and below, you will observe a “beam spreader.” It’s job is to hoist the sections of approach roadway into place and hold them steady while crews of workers secure them to both the pylons which will support them and to the previous sections already installed. You can see the difference in altitude between the old and new roadway in the shot above, with the older approach visible to the right hand side of the shot, backed up by the Freedom Tower. After decades of inertia, wherein the various governmental entities found here in the megalopolis barely had the funding to perform basic maintenance on the various bits of infrastructure which make it possible to move people and commerce around, it’s actually startling to see so much of it going on all at once. 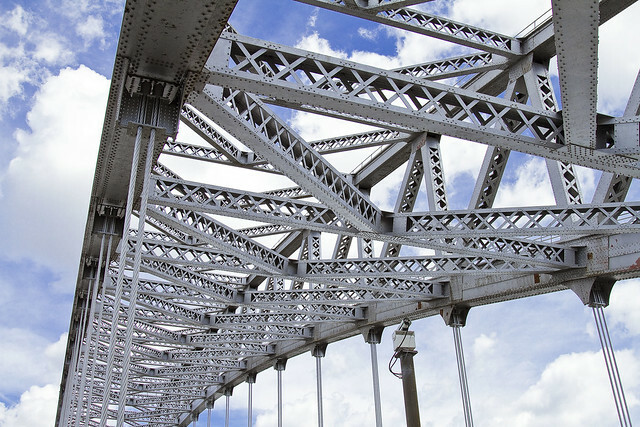 There is no investment more prosaic to make than in infrastructure. 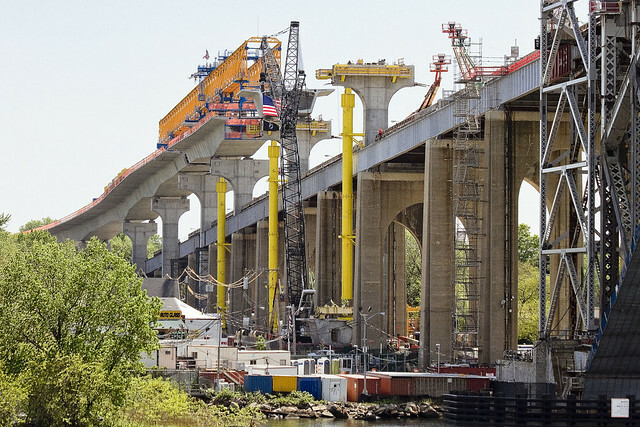 Unfortunately, in the case of all three bridge projects mentioned, none of them have avoided the mistakes of the House of Moses and incorporated a light rail line or any sort of mass transit into their modernizations. We are reinforcing and advancing the age of the Automobile. Sorry – could not resist the pun. 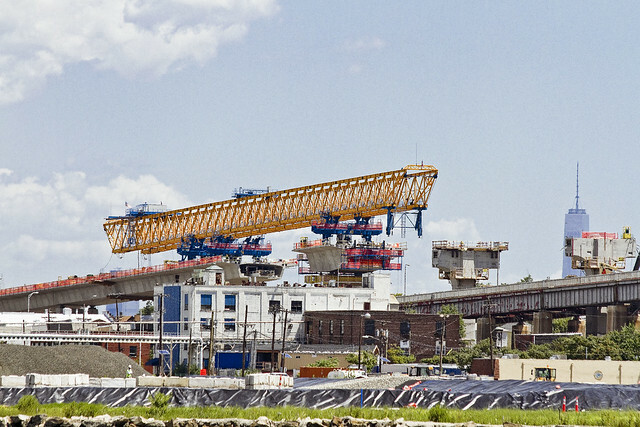 The Bayonne Bridge project is ongoing, and will continue to be documented at this – your Newtown Pentacle. 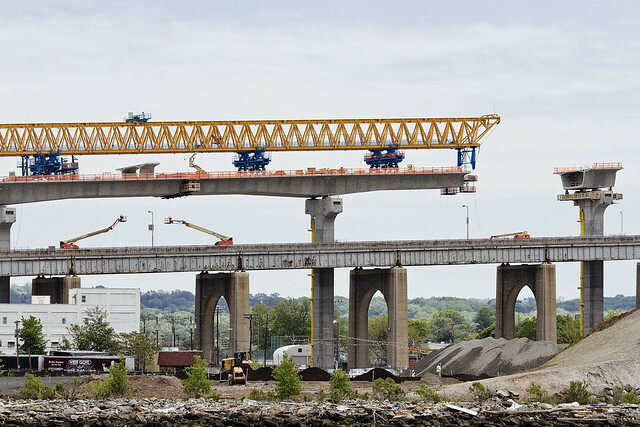 For more on the Bayonne Bridge project, direct from the “horse’s mouth” as it were – check out this page at the Port a Authority’s website. Maritime Sunday bobs to the surface. 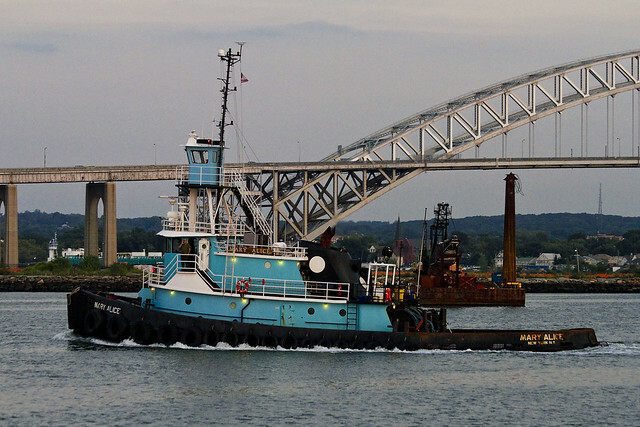 Joan Turecamo, IMO number 7902025, is a 392 ton Tug which was built in 1981 at the Matton Shipyard in Cohoes, NY. She’s owned and operated by the Moran Company, and was recently spotted while onboard a Working Harbor Committee “Beyond Sandy” tour. 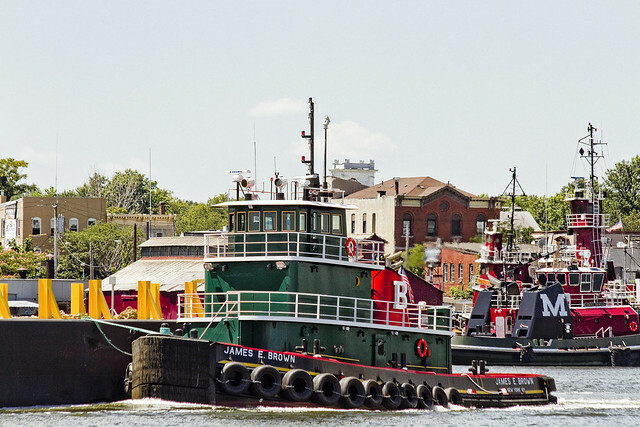 In the background is the ill fated Bayonne Bridge spanning the Kill Van Kull, a structure whom modernity has labeled “an impediment to navigation.” Maritime Sunday shout outs to the Moran tug and her crew. 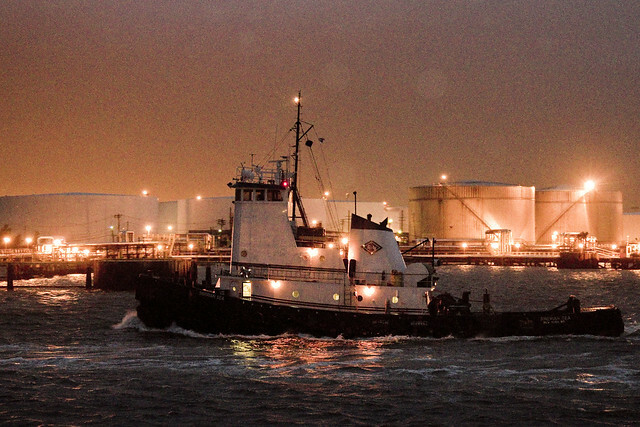 Just a short one today, the tug Mary Alice rolling along at twilight. Back tomorrow with something a bit more substantial, but today must be spent with loved ones as the world soon ends. Only 12 days left until the 13th b’ak’tun ends, initiating the Mayan Apocalypse on December 21st, after all. That’s the Bayonne Bridge, mentioned a couple of times this week, spanning the busy Kill Van Kull. The last “regular” Working Harbor Committee excursion of the year was recently enacted, and we encountered sometimes heavy weather and an overcast sky which laid down a pall of preternatural darkness upon the harbor. The air itself was thick with fog and mist, and many were the times which I needed to clear my lens of condensates. Denizens of the harbor used to such visual occlusion, the working vessels and tugs kept to their normal routines. Hushed intonations have been offered to your humble narrator in the past suggesting that a suite of electronics are commonly found onboard these machines. These esoteric devices neutralize the need for direct line of sight, allowing the operator to remotely sense the environment around them. The shadowed shoreline observed in these shots is the so called “Chemical Coast” of New Jersey. 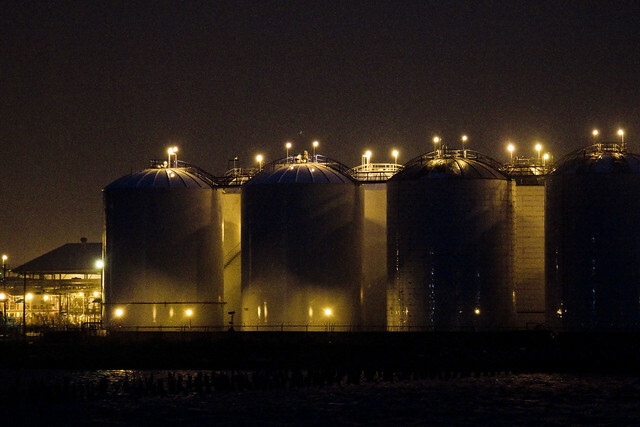 The name was earned in an earlier century, when Bayonne was famed for its mastery of colorant and dye manufacture, before the oil industry arrived with the Rockefellers. The bridge seems absurdly high, much more than its actual height suggests. This is largely due to the low lying shorelines which comprise the surrounding terrain, which are a vast tidal floodplain reclaimed by landfill techniques from the swampy marshlands which nature intended. One or two members of our small party found themselves suffering the effects of vertigo, but luckily your humble narrator was not one of them. My paranoid fantasies allow little room for other psychological complaints to crowd in. Attempts at “getting artsy fartsy” with the camera were what occupied me, and along the way envy for the unique perspectives captured by the daring bridge photographer Dave Frieder crawled into my mind. If you don’t know Frieder’s work, you should. He made a career of climbing the bridges of New York City (and beyond) and captured extraordinary images while doing so. He is also quite the expert on bridge engineering. 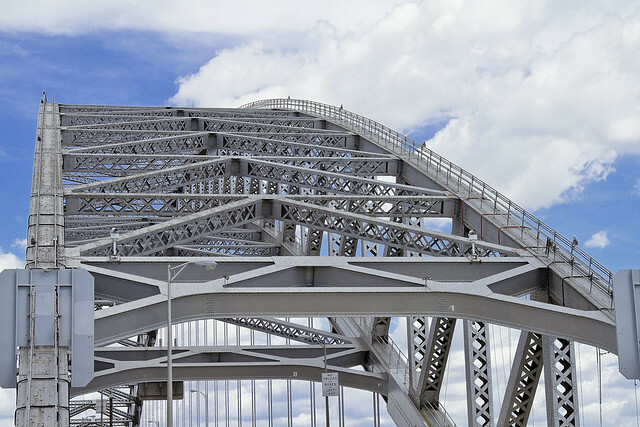 There is true beauty in the arch component of the Bayonne Bridge, one can visualize the lines of force moving through the steel. 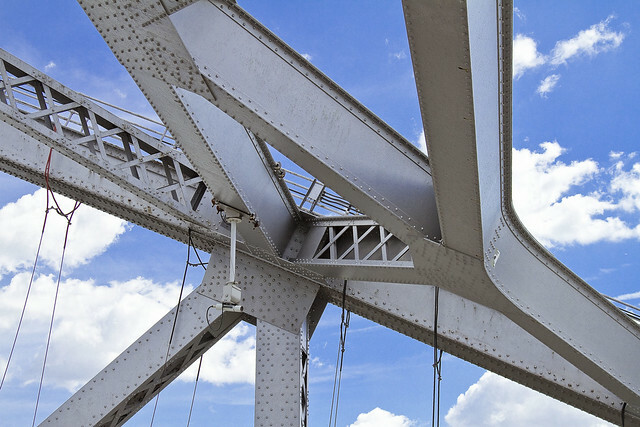 Othmar Amman, who designed the bridge, often allowed the structural elements of his work to remain visible. Before him, engineers would be compelled to erect facades of masonry or cement to encase the steel, but he liked to let it all hang out. 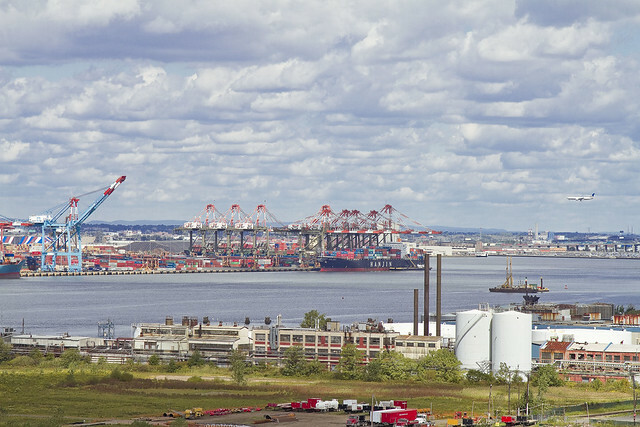 Looking to the west, and New Jersey, one may observe the gargantuan Port Elizabeth Newark dock complex which serves as one of the main engines of the Port of New York. 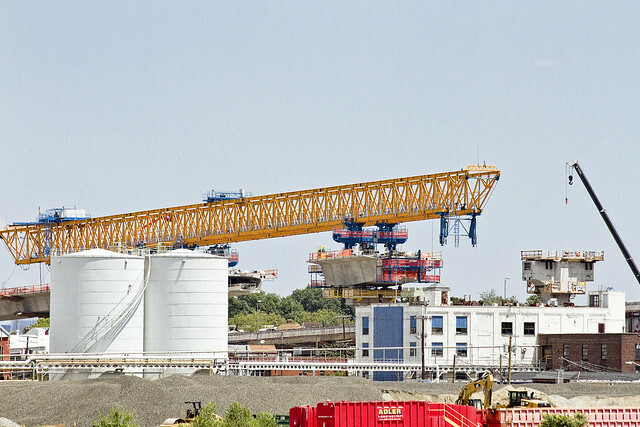 Gantry cranes and stacked shipping containers obscure Newark Airport behind it. Beyond lies the continent, and the United States. To the east is witnessed the city state which lies off the coast of America, the shining city. 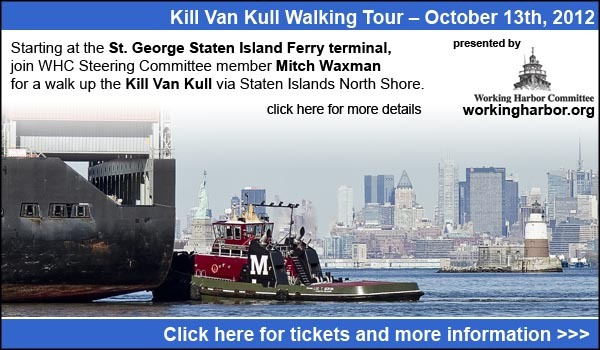 The Kill Van Kull is the body of water spanned by the Bayonne Bridge, a tidal strait which connects the port facilities to the west with ocean going traffic. 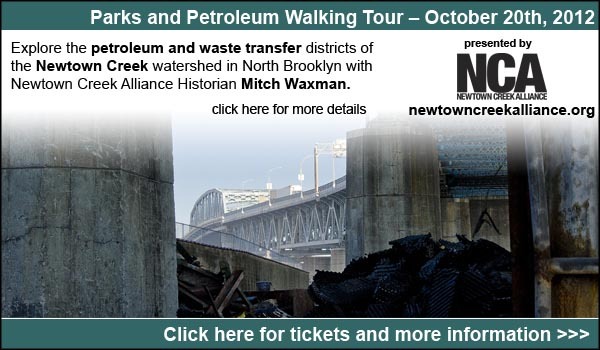 The Kill has been discussed thoroughly here at your Newtown Pentacle, and a section of its landward side on Staten Island is actually the subject of a walking tour (offered below) which I conduct for the Working Harbor Committee. The Staten Island side of the Kill is “The North Shore” and the Jersey side is called “The Chemical Coast”. Some work on the bridge has already begun, as evinced by the construction aprons being installed. The initial phases of things involve the removal of generations of lead based paint which protect the structure from corrosion. In our environmentally and politically correct age, such material is anathema, and must be removed. Discussion of the EPA administered site on the Staten Island side which is polluted with Uranium, of course, will be kept to a minimum. 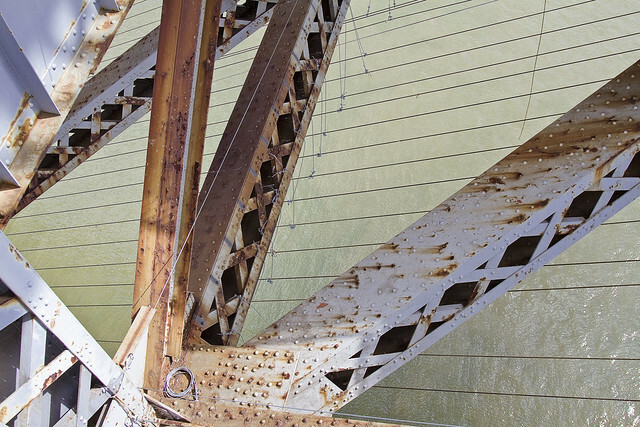 Slouching downward toward Bayonne, those lines of force I mentioned earlier dance within the steel. Not pictured, incidentally, are the many bits of signage installed along the walkway advising the citizenry against suicide. Were my only choices for residence New Jersey or… Staten Island, despondency might set in, but one cannot believe that either is “that bad”. 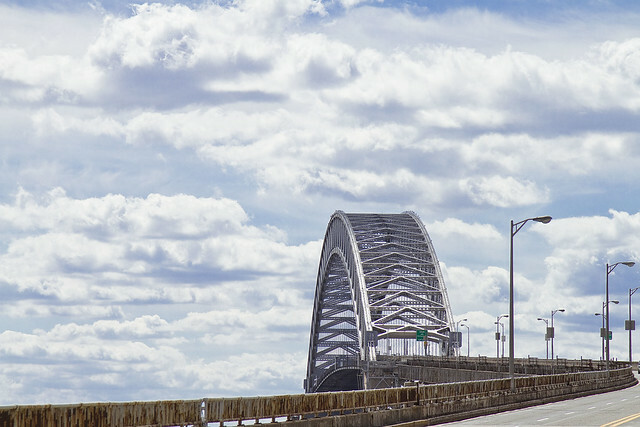 Since the City keeps the suicide counts for individual bridges quiet, I can’t provide any insight on this, but is the Bayonne Bridge a favorite spot for such activity? Fully ensconced on the New Jersey side, the roadway betrays its destination via signage. Morningstar Rd. seems to be innocently named, but upon seeing the sign, I could not help but think of two things. First- the Morningstar in occultist circles is Venus, and Second- Morningstar is the last name of the transmogrified archangel Lucifer. Perhaps those anti suicide signs are more prosaic than I thought. 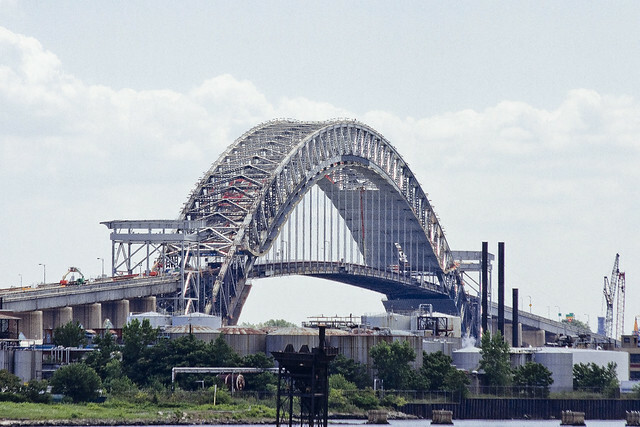 Does the Bayonne Bridge quietly connect to some outer borough road to hell? Bayonne Bridge as seen from the New Jersey side, as our little party entered the unknown country of Bayonne in search of a diner. Luckily New Jersey is lousy with such establishments, although there is a significant difference in the meaning of “sloppy joe” over there. The NYC sloppy joe is what the rest of America would call a “loose meat sandwich”, whereas in NJ it’s a three layered affair which involves turkey breast, cole slaw, and russian dressing- amongst other things.